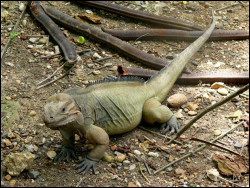 Iguana Control is a very specialized service that homeowners often need in the deep south section of the United States, in such areas as south Florida, The Florida Keys and in some areas of Texas. However most of the complaints are most common to the areas around South Florida. These Reptiles can be founds as far north as Tampa Bay, FL We also have other information on this site about the damage that iguanas do like, digging in yard. There are numerous problems that goes with having igtanas around your home, If you feel threatned by these reptiles, you should seek professional help. These animals can be very aggressive and should only be handled by a professional with the correct equipment and knowlege. What Type of Iguanas cause damage? There are three types of Iguanas in the South Florida area, they all came here as pets, these reptiles are not native to this area and the state of Florida does consider them a invasive species. They are the green iguana (Iguana iguana), the Mexican spiny-tailed iguana (Ctenosaura pectinata) and the black spiny-tailed iguana (Ctenosaura similis). The problems with Iguanas is they are cute creatures when they are small, therefore many parents buy these creatures from pet stores for their children, they get them home and the iguana stats to grow, and grow and will continue to grow until it is over 5 foot long. When they get this large they do not make good pets, You can never really tame a iguana fully so once people realize this they simply let the iguana go into the wild. They will parish everywhere in the US but south Florida. This is exactly the way the south Florida population was established. How do I catch these nuisance Iguanas? Nuisance Iguanas are sometimes very hard to catch, however there are multiple ways to catch them. Traps, noose poles and other manuall ways of capture area the most common. However I must warn you, these animal can and will put a very nasty bite on you so great care should be taken at all times when trying to catch a iguana. We would recommend a professional iguana trapper to do this for you, you can find one by visiting our professional trappers list, select your area and simply call the number. They will be able to help you with you iguana problem. We also have a Iguana photo gallary located here.